Doctor Stephen Strange is one of those oddball superheroes that the mainstream moviegoer might not have heard of. Trained as a doctor, and once one of the most skilled surgeons in the world, a car accident stole the steadiness of his hands from him. As he searched for a cure for himself, he met Earth's Sorcerer Supreme and apprenticed under him. Now, a slightly more humble man, he uses his new found skills to aid the Avengers in their mission to protect the Earth. 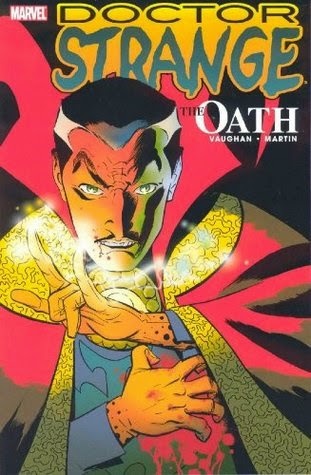 In Doctor Strange: The Oath, we meet Strange in Night Nurse's waiting room. Someone's shot him, but that's not Strange's biggest worry. His assistant, partner and friend Wong is dying, and even Strange is wondering whether he'll be able to save him. The story goes backwards and forwards in time, showing the reader his arrogance and disregard for the suffering of those around him, the accident that sent Strange down his new path towards sorcery, and more recent events as he's searched for a cure for Wong. And Strange is so very close to a cure. The elixir that he traveled to another dimension to find is said to 'erase what troubles the mind of man." But what if this doesn't simply cure Wong's tumor? What if it is the cure for everything? And what if some people don't want everything cured? Brian K Vaughan is one of the most popular comic writers in recent years, and with good reason. After wrapping up an amazing run with Y: The Last Man, he started his award-winning series Saga. With The Oath, Vaughan brings his amazing characterization and storytelling to a character who has quite a bit of depth to him. The Oath is a wonderful introduction to a character who is Earth's greatest defender against all that the other dimensions can throw at us. Highs: Night Nurse deserves her own comic, hands down. Lows: I'm glad how the story eventually resolved, but I wish Strange would eventually grow out of a bit more of his selfishness. Verdict: The Oath is a great place for new fans to start, especially those wanting to get a feeling for the character before the movie comes out. Every classroom has one. The student who will do absolutely anything to avoid paying attention in class. Generally that student's repertoire is limited to staring out the window, reading comics, or perhaps playing with his phone. Occasionally, such a student creates a distraction, or annoys the students adjacent to them, but this usually draws enough attention that the teacher puts an end to it. Unfortunately, not only are Seki's distractions fascinating, but he's a master of stealth in My Neighbor Seki Volume 1. Poor Yokoi. Poor, poor Yokoi. At this rate, she'll never be able to pay attention in class again. But who could blame her? Seki simply refuses to sit still and do his work. And what he actually is doing is much more interesting than what the teacher's trying to get across. For example, in 2nd Period, Seki starts a game of Shogi. Sort of. He's turned Shogi into a drama about loyalty and betrayal and possibly a resurrected king? 5th Period doesn't go much better. He's switched over to Go this time...but Yokoi's not sure about the rules of Go. Are...are there teddy bears and bunnies involved? Is that normal? Wait...a cat? Why is there a cat in 6th Period? Multiple cats? Is this normal? Ouija boards, robot toys, crocheting...there's a lot going on in the back row here. Unfortunately, there's not much note-taking. Will Yokoi ever be able to concentrate again? The premise of My Neighbor Seki is fantastic. The chapters are short enough that they don't begin to get tired, and the ideas are so far-out that there's plenty of room for the author to play around. 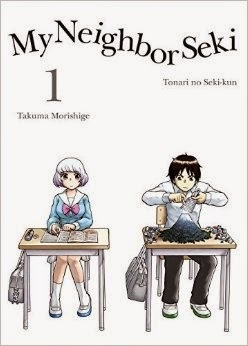 The art's not always amazing, but it's completely serviceable for the type of story that it tells, and it's clear who's who and what's going on .Overall, it's a hilarious manga that's a great way to spend a few minutes here and there.